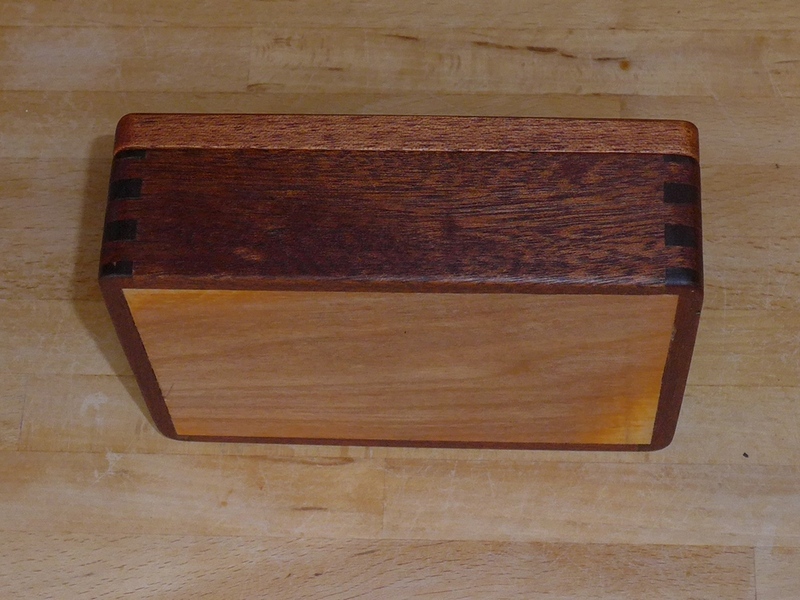 I decided to make a small box for the first time in years. 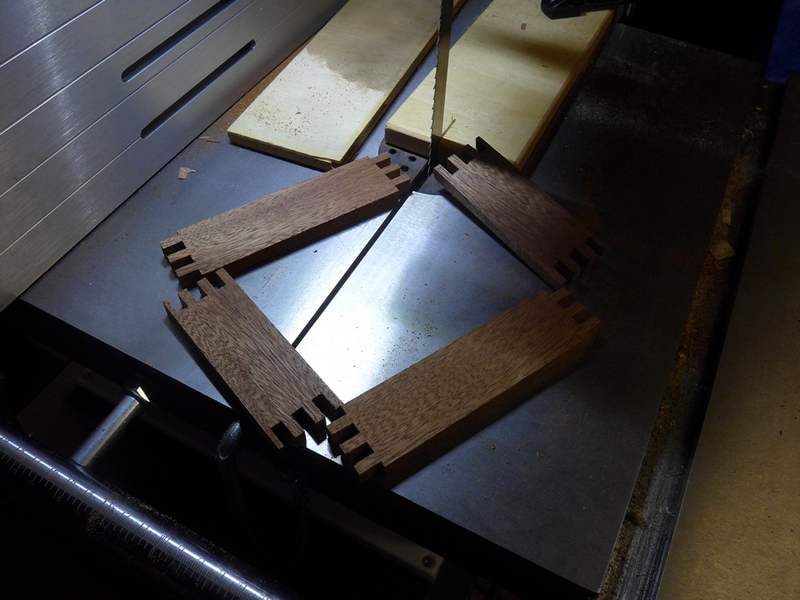 I just made it up as I went along really. 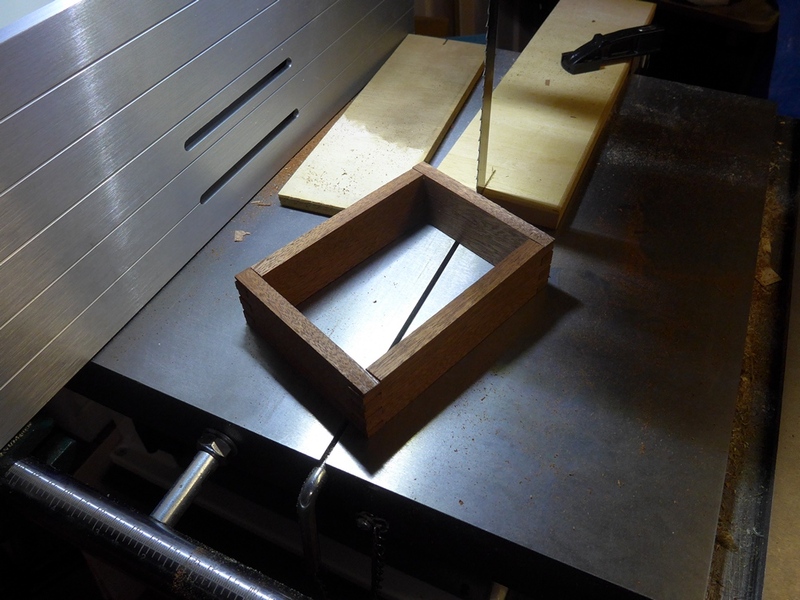 I knew that I would use box joints cut on the bandsaw. 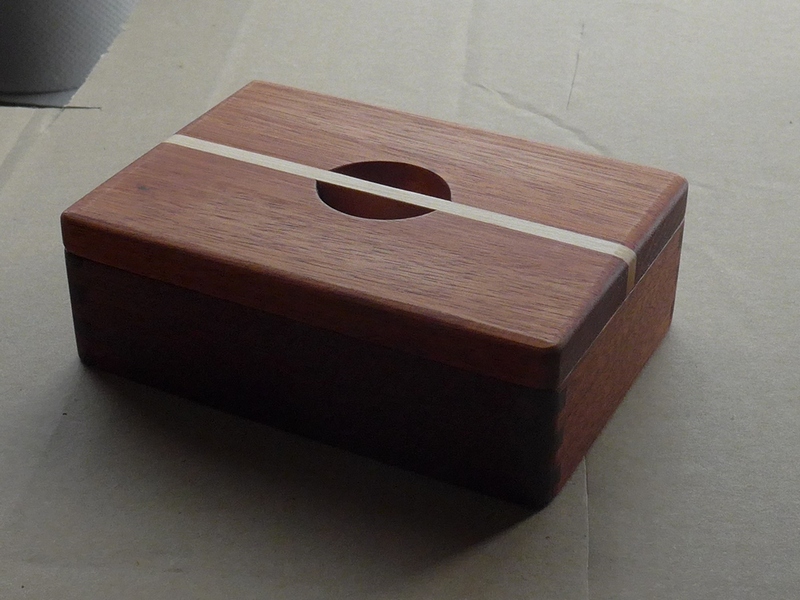 Most other ideas like the base, the lid and the ‘handle’ came to me as I was making it. 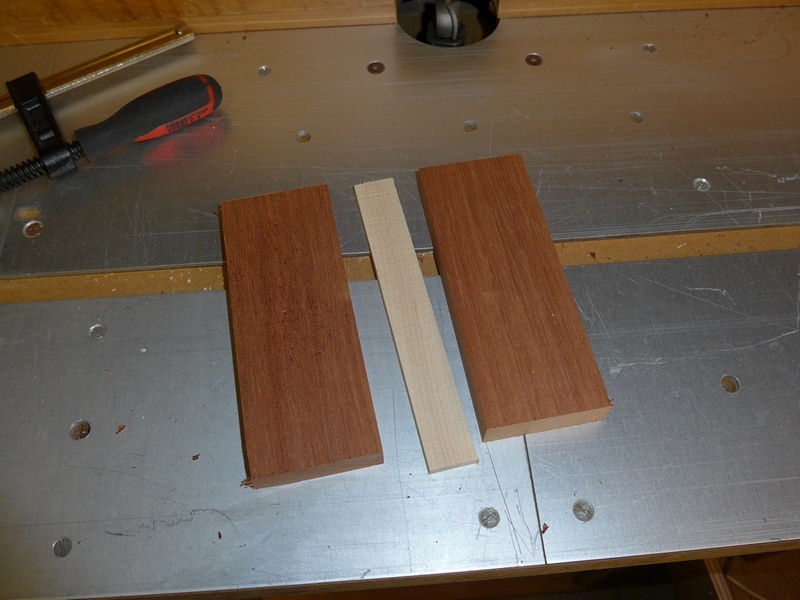 I cut some African Mahogany for the sides, using the bandsaw. 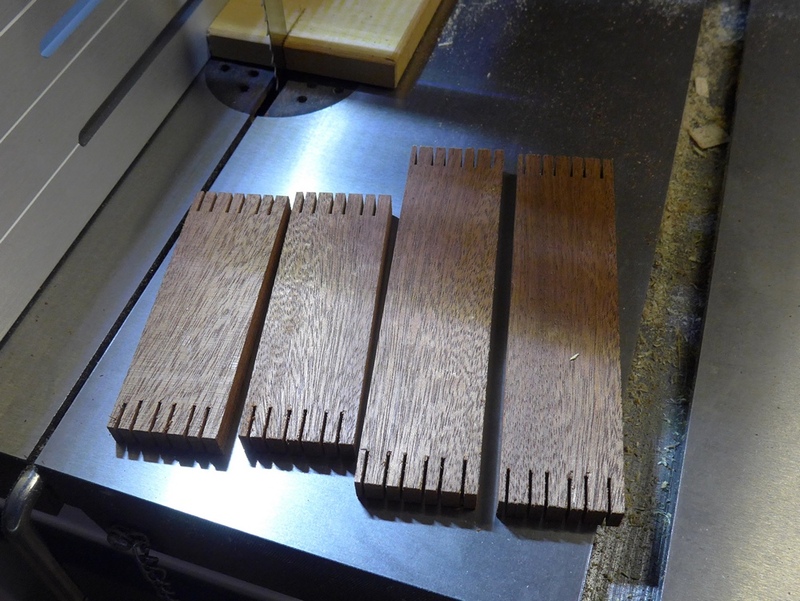 That included re-sawing from thicker stock. 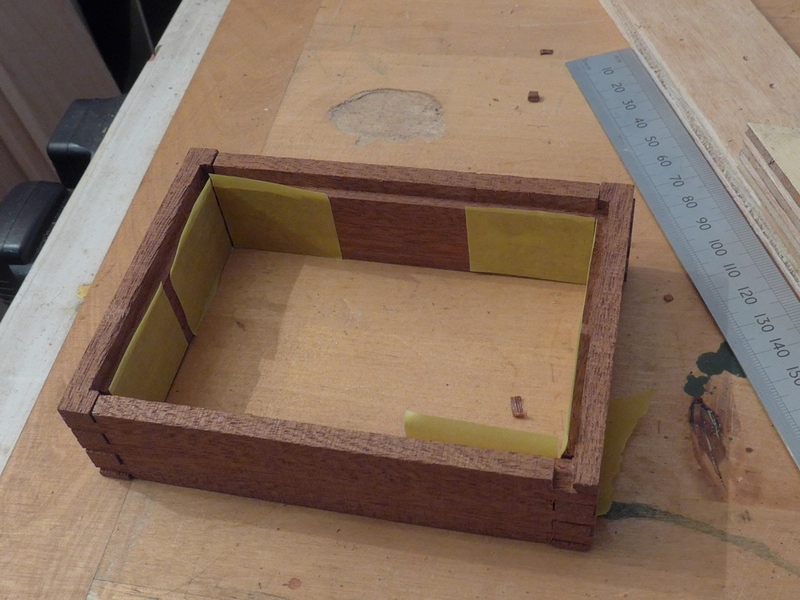 The joints were not as tight as I’d hoped for, but just about usable. 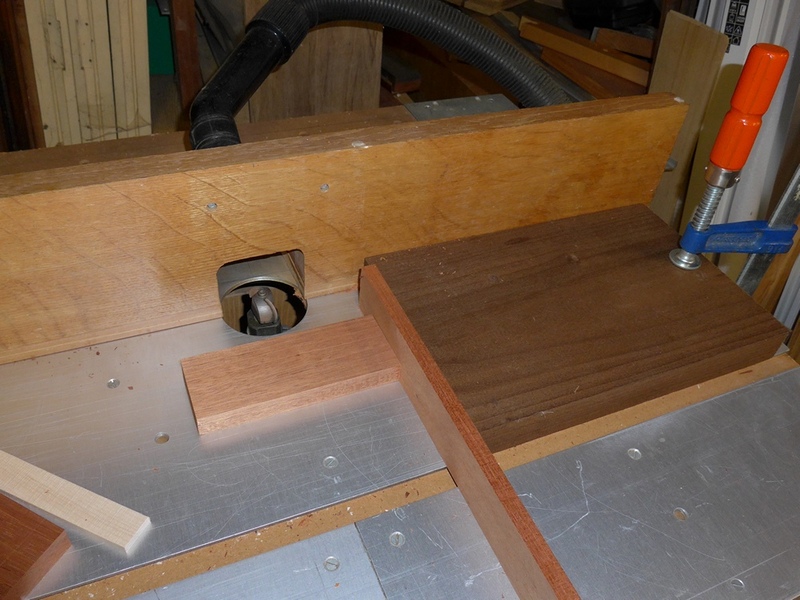 I decided to use a piece of plywood for the base, recessed into the sides. 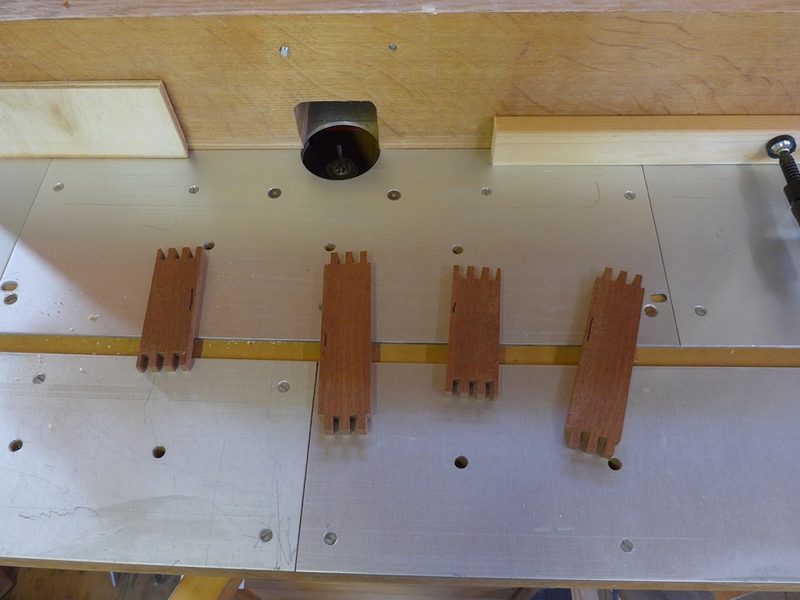 So I needed to cut stopped rabbets along the bottom of each side. 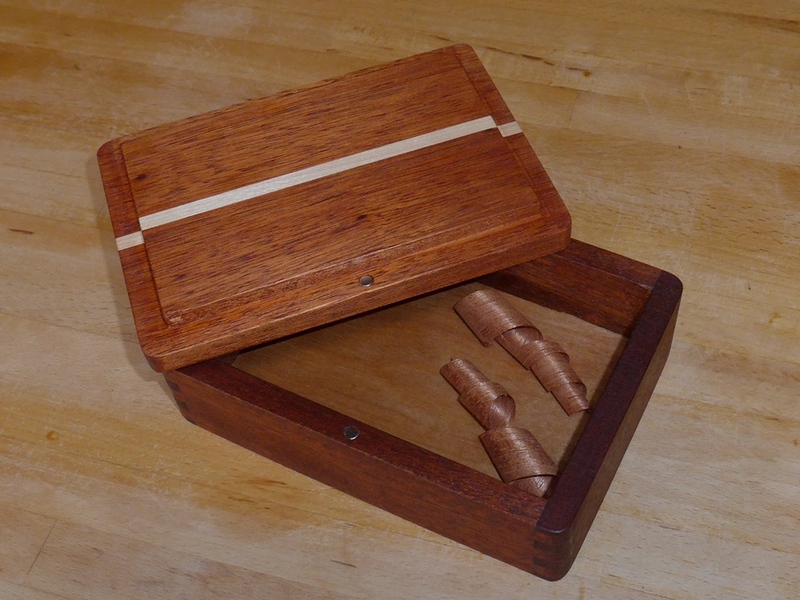 If I hadn’t stopped the rabbets short of the end of the pieces I would have ended up with holes in the side of the box. 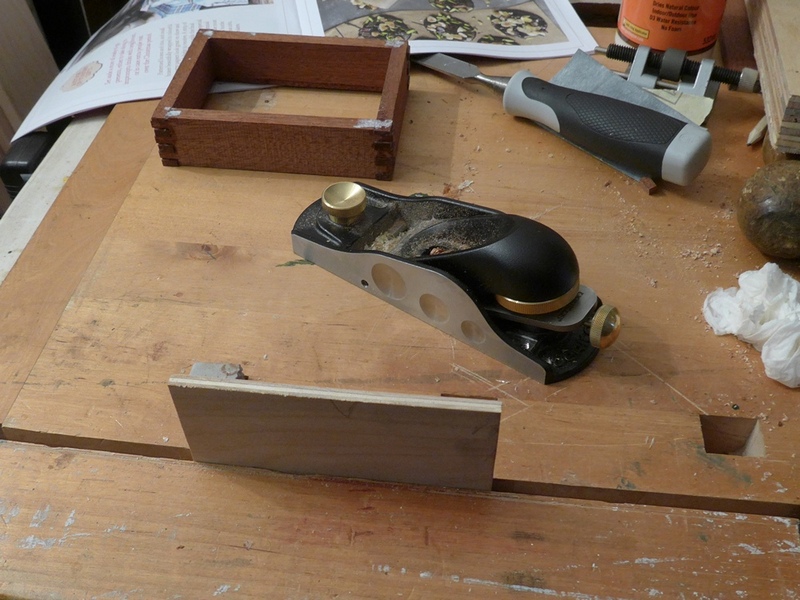 I marked each piece with a permanent marker to remind myself which edge to cut. 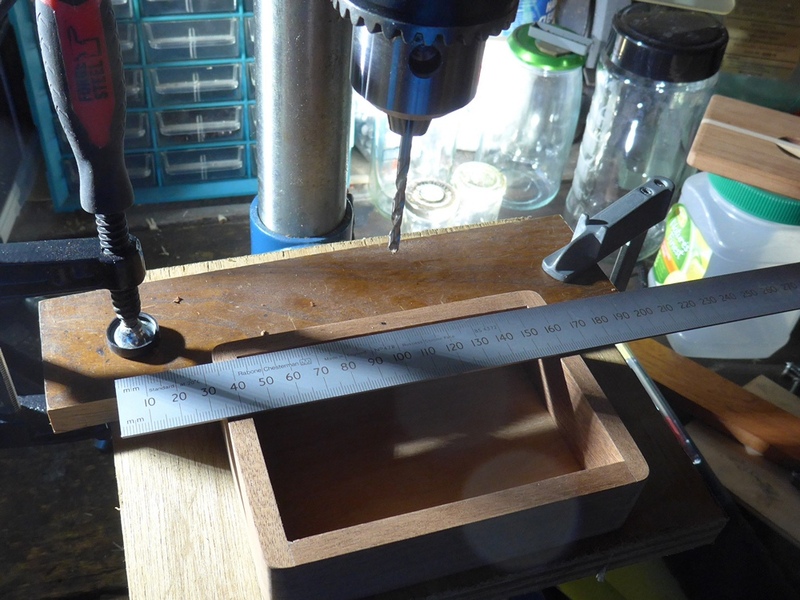 Whilst trimming the inside corners using a chisel, I accidentally broke off one of the fragile fingers (lower right corner in the photo). 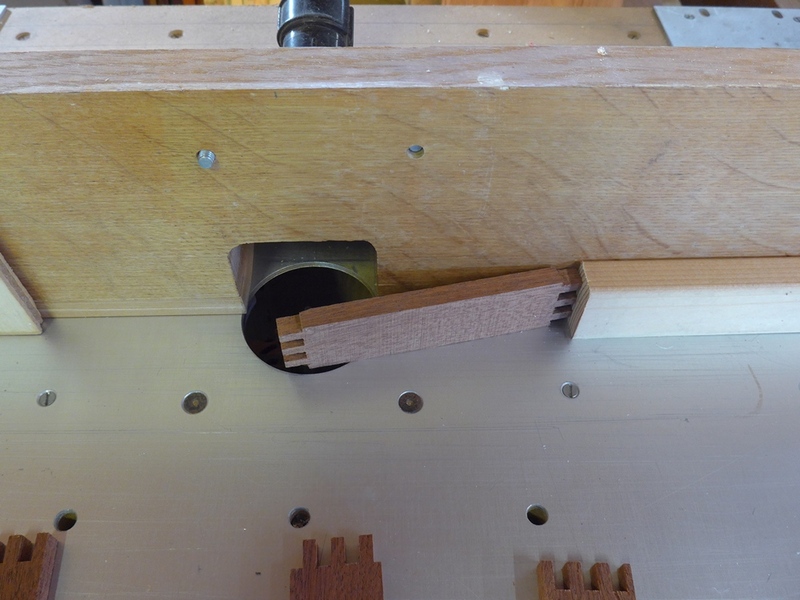 To fix the broken finger joint I inserted a small piece of matching wood. 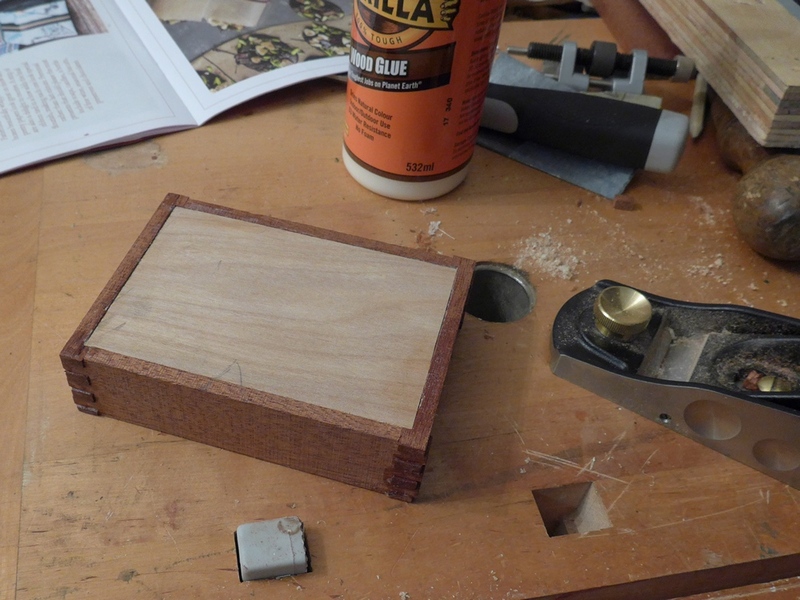 Then I glued it in place using a minimal amount of glue and being careful so that no glue would squeeze-out on the inside of the box. 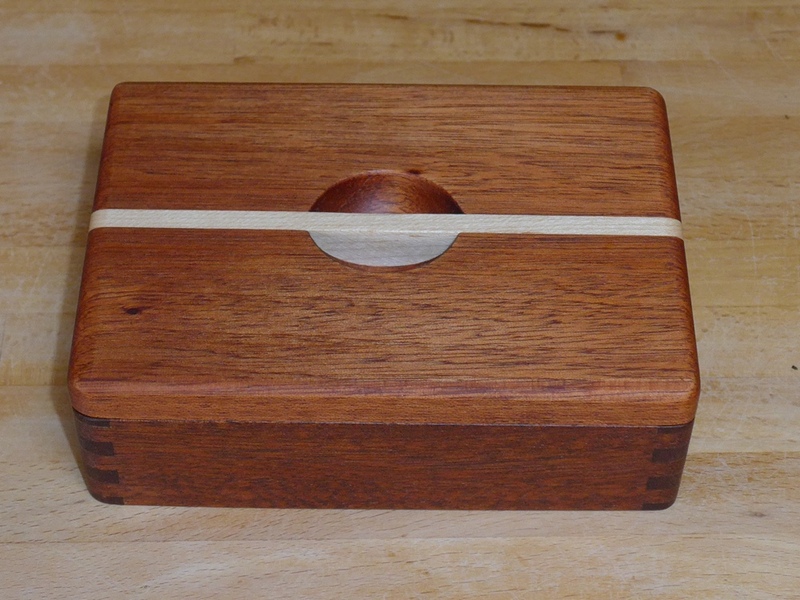 Now that the box was glued it was time to make the lid. 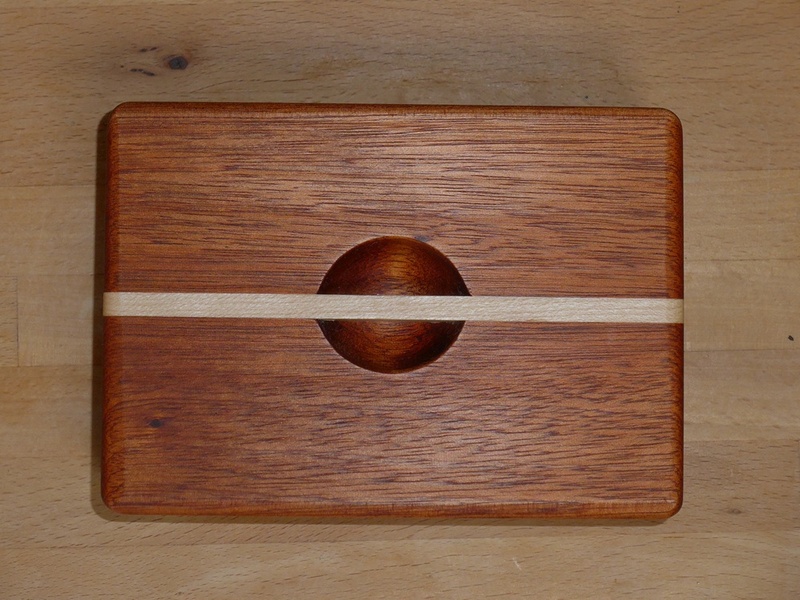 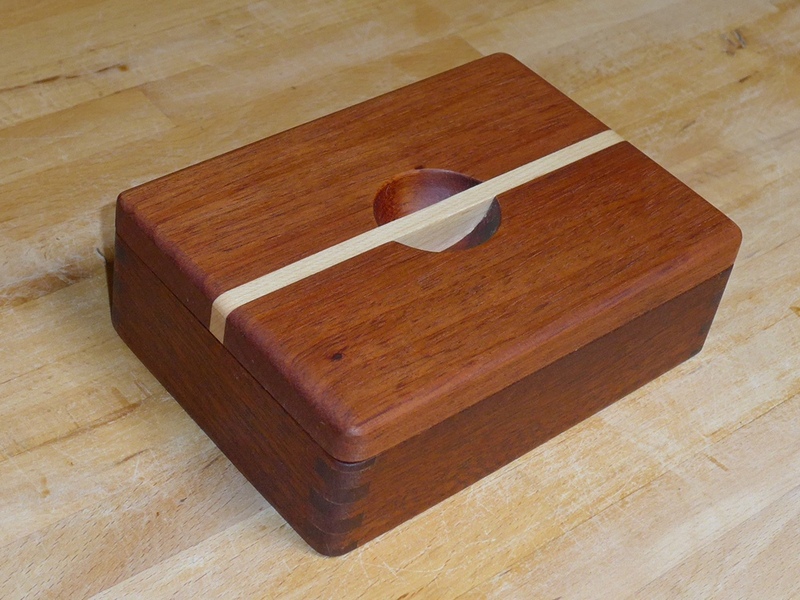 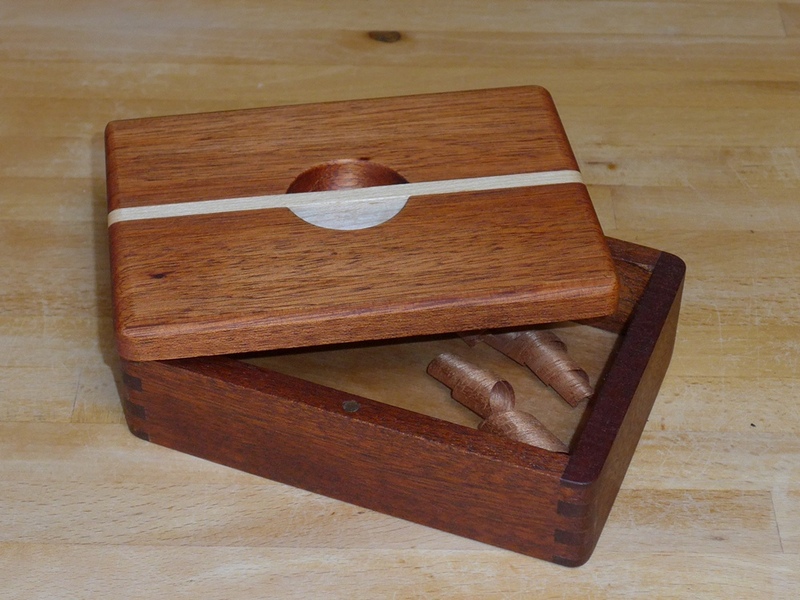 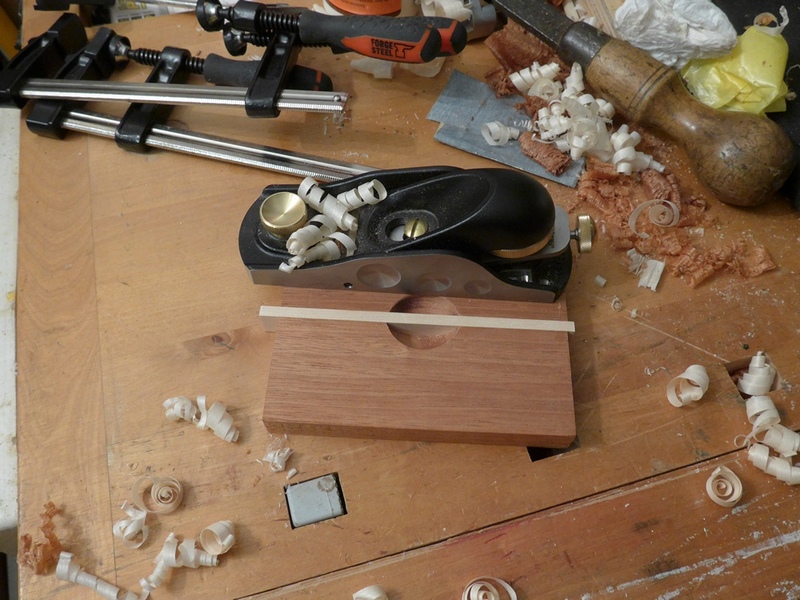 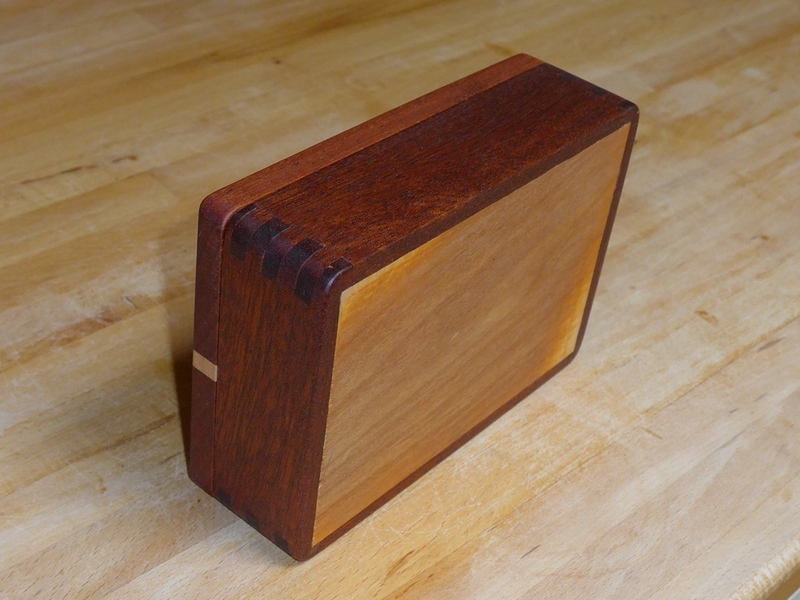 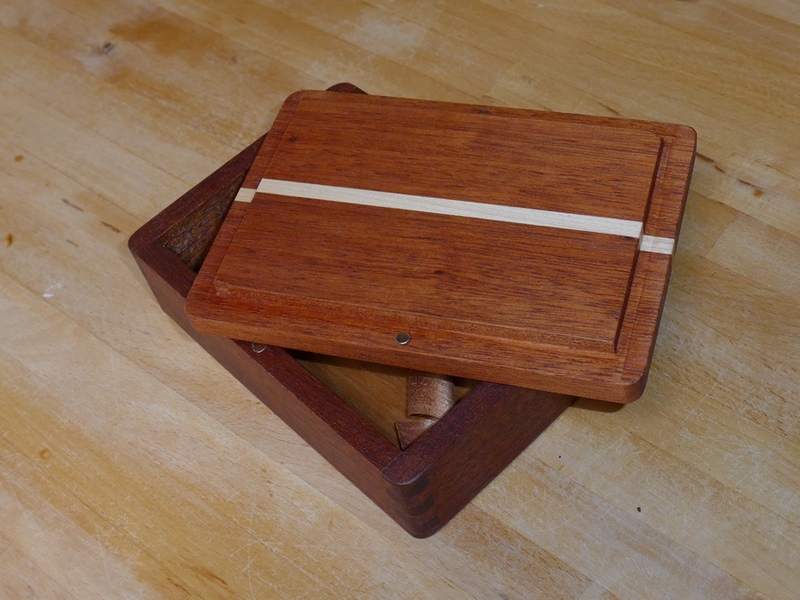 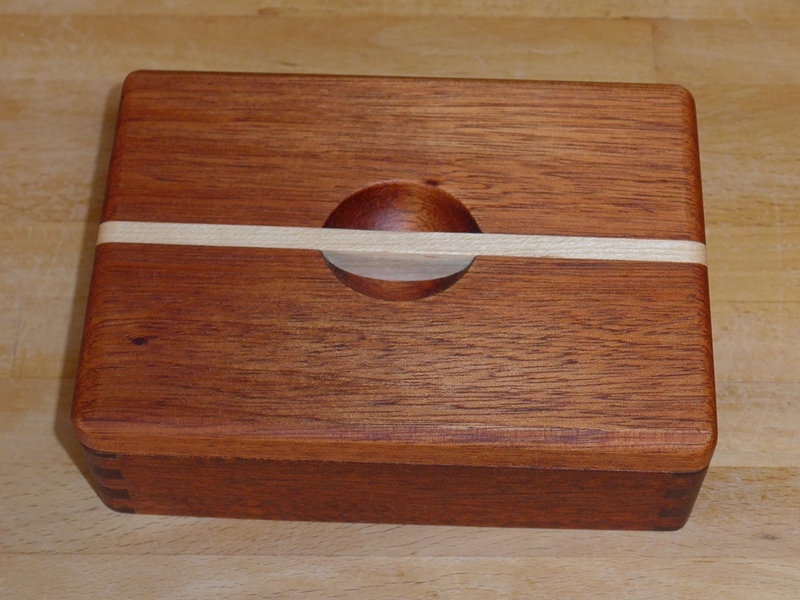 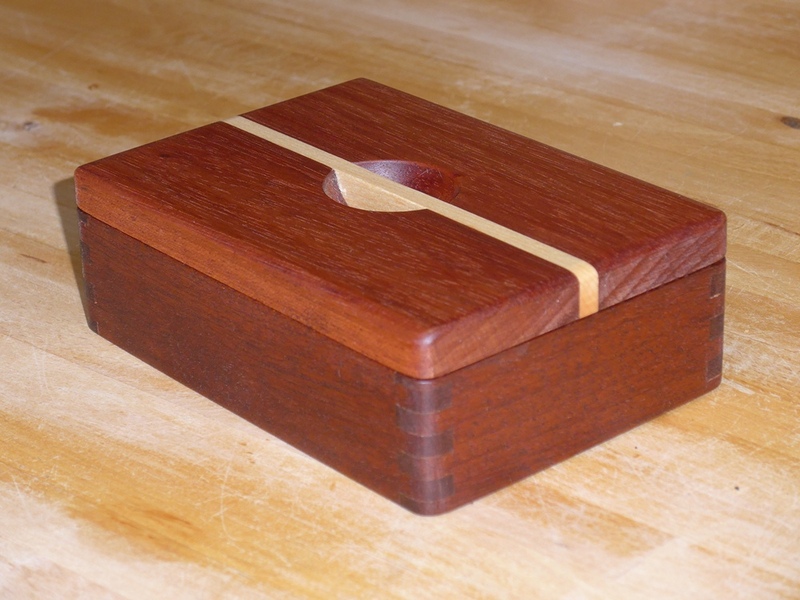 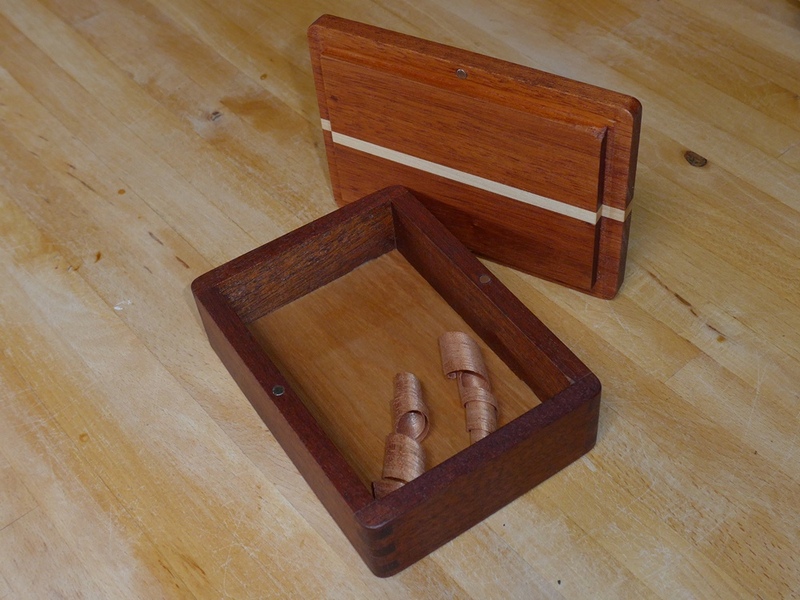 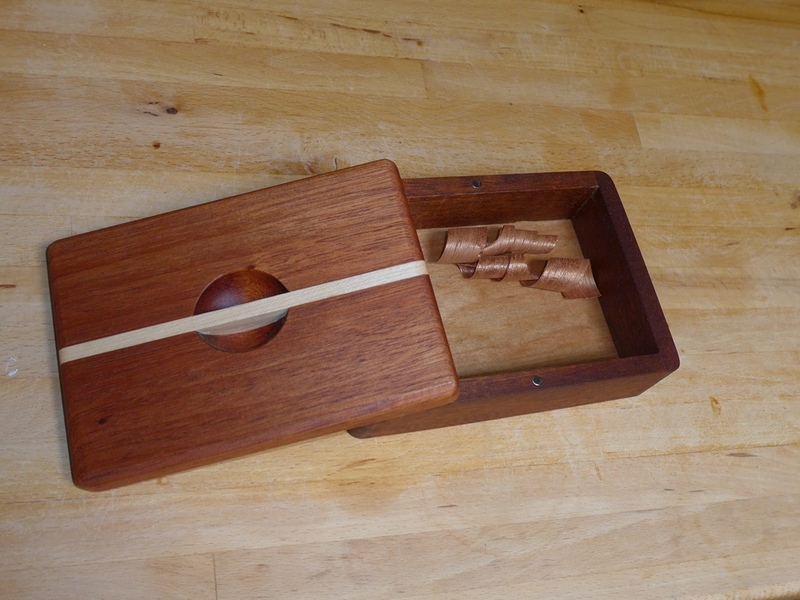 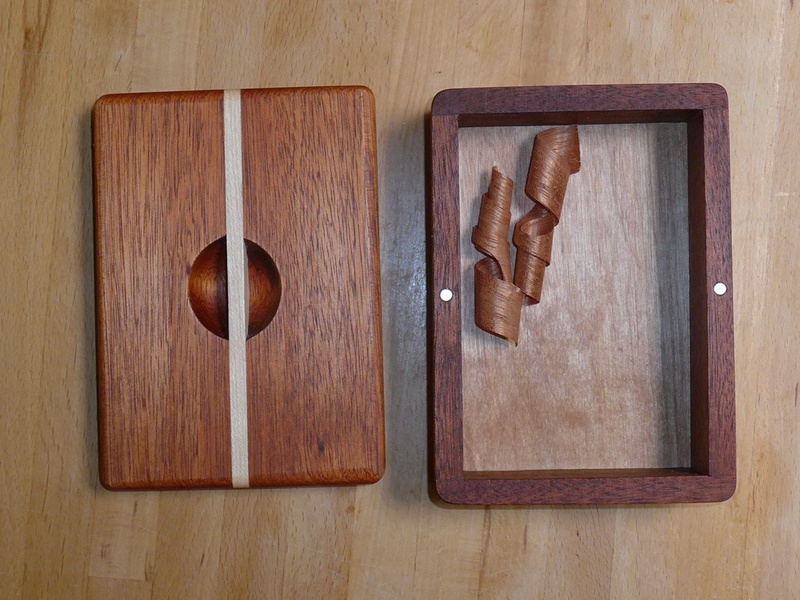 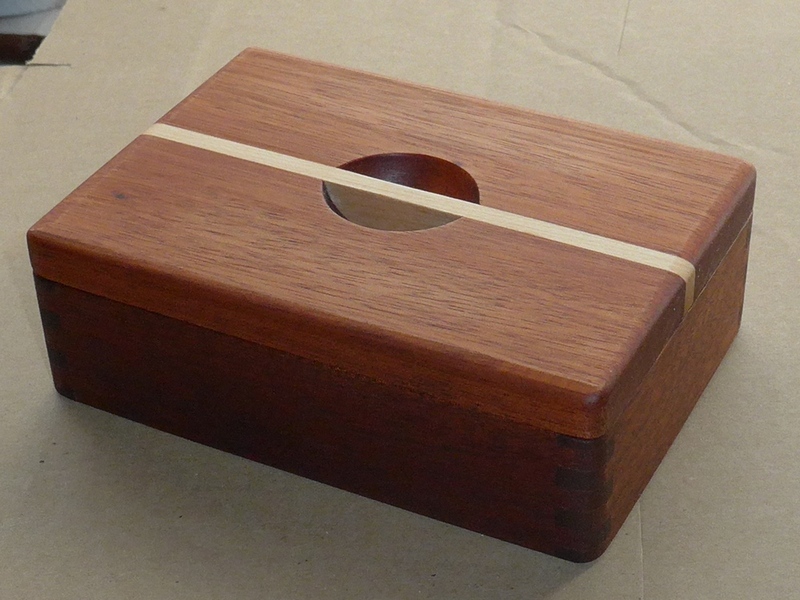 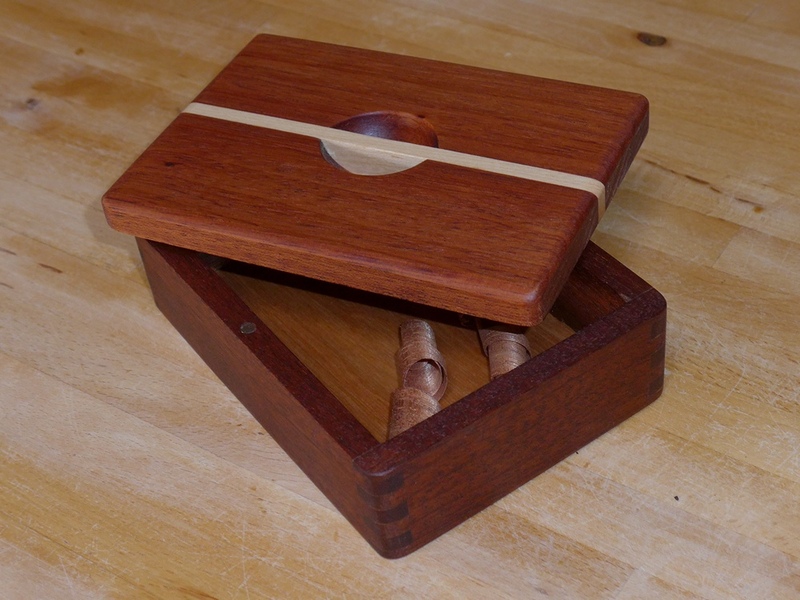 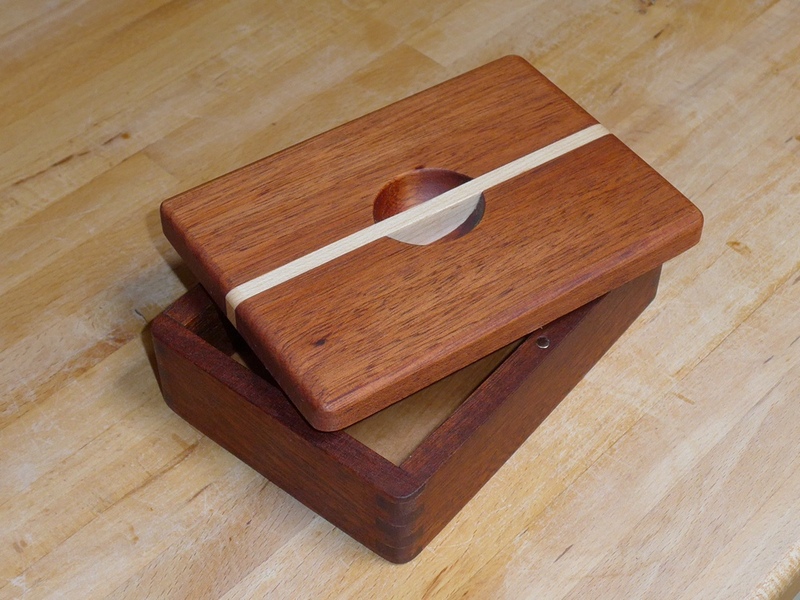 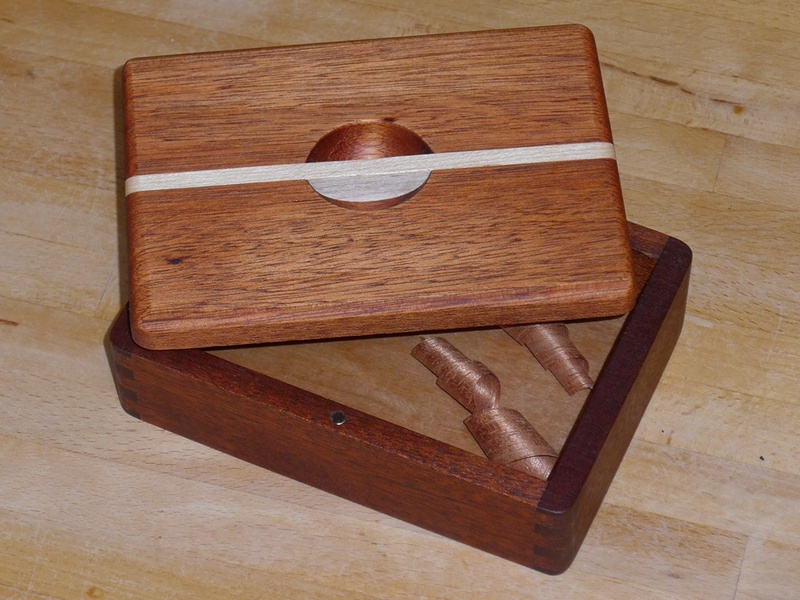 The handle would be formed using a piece of maple between two pieces of what I had assumed was African Mahogany to match the box, but turned out to be a different wood altogether – probably Sapele or something. 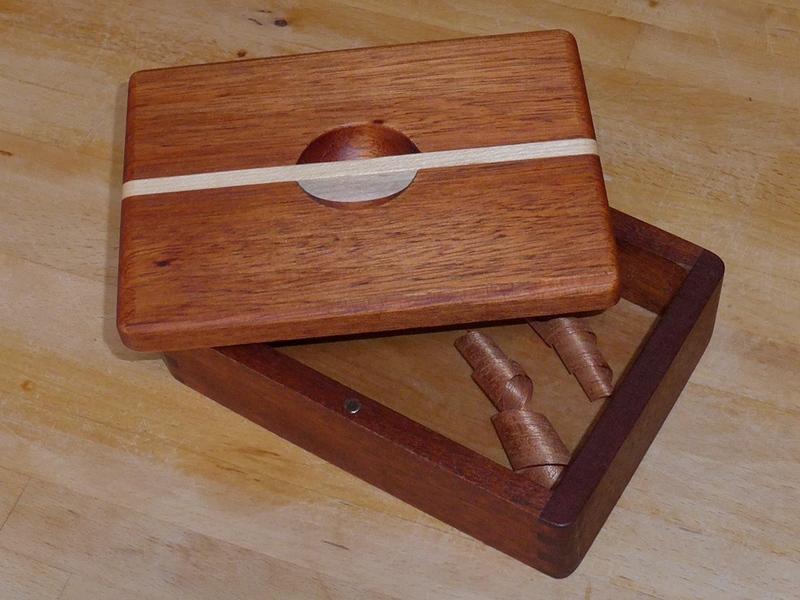 DOH! 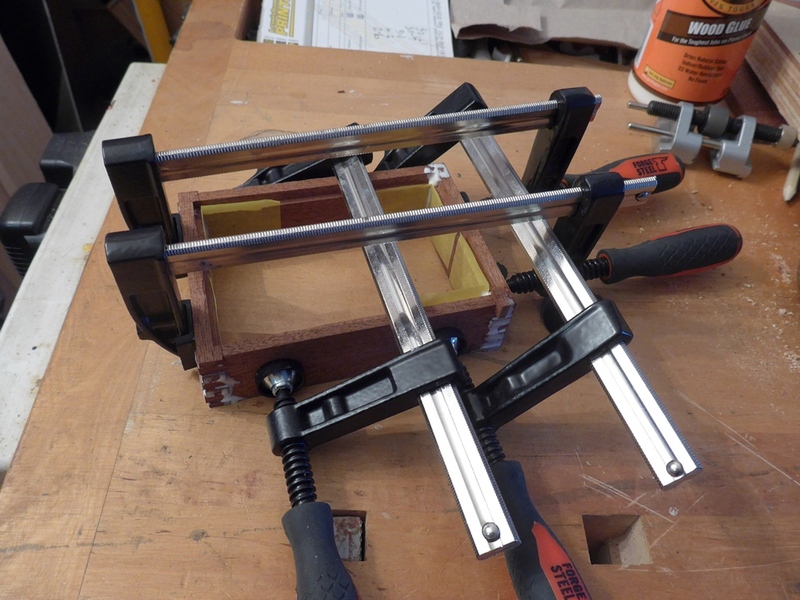 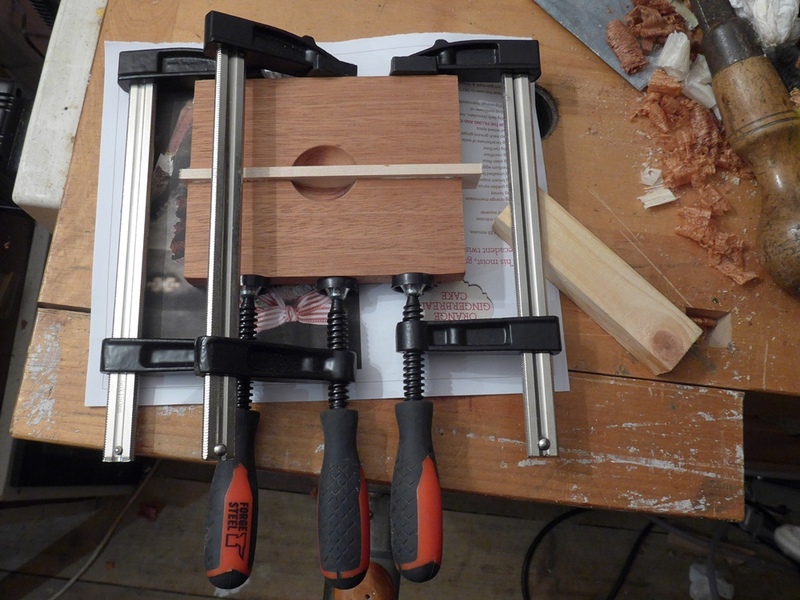 Using a block of wood clamped to the router table and another strip along which my work-piece could easily slide, I carefully pushed the wood into the dome-shaped router cutter. 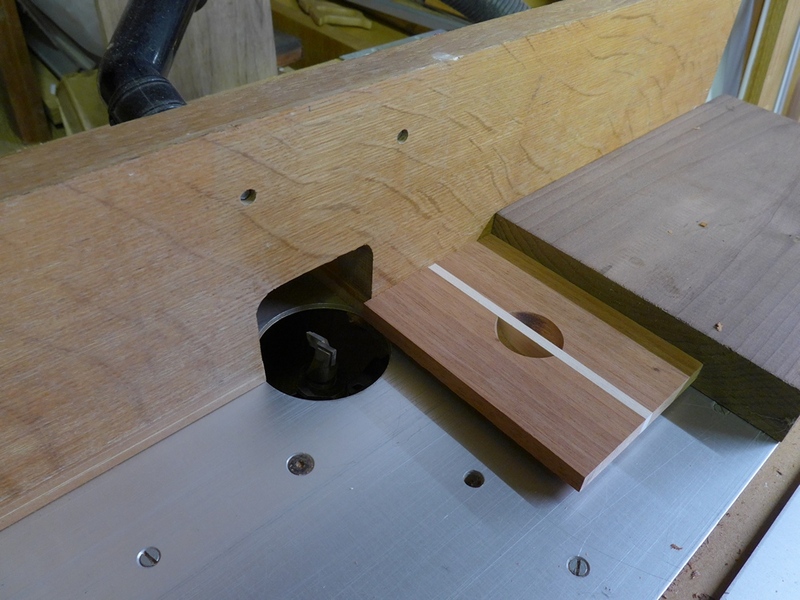 .. then trimmed the ends, first using the bandsaw and then using my new shooting board. 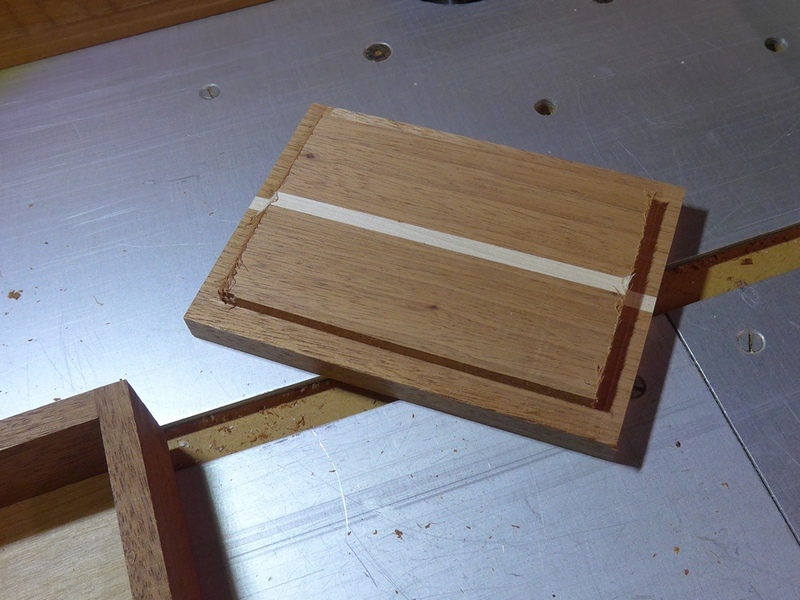 Next, using a ¾” flat bit in the router table I ran a rabbet around the inside edge of the lid so that it would rest snugly in the top of the box. 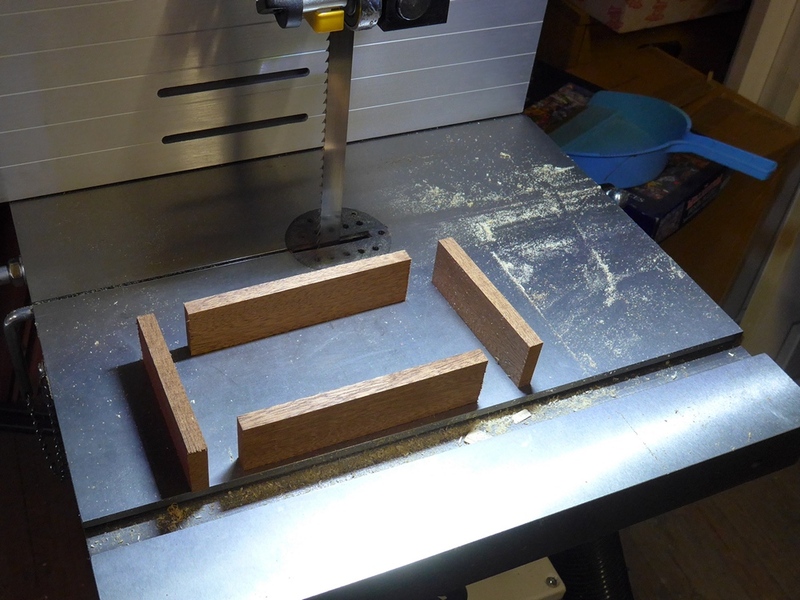 I ‘crept-up’ on the final dimension by making a series of fine cuts, testing for a good fit after each one. 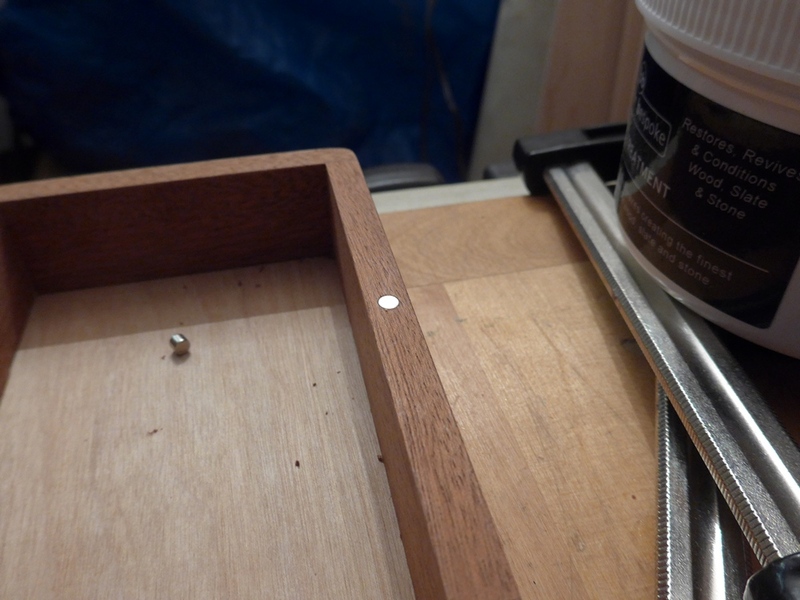 I glued the magnets into their holes using super glue, making sure I had the polarity correct by marking each magnet with a permanent marker indicating which end should go into the hole. 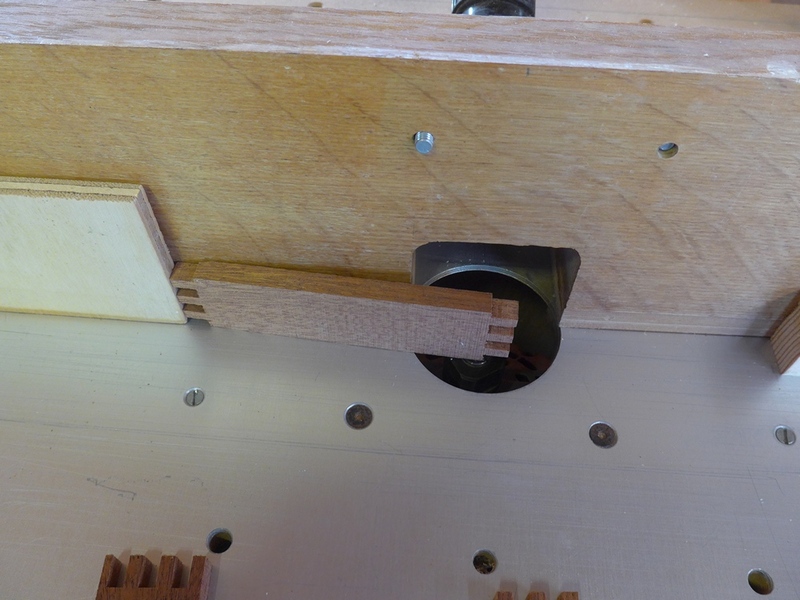 One of the magnets I pushed in too far without glue but couldn’t get it out again so I just left it, hoping it wouldn’t fall out in service. 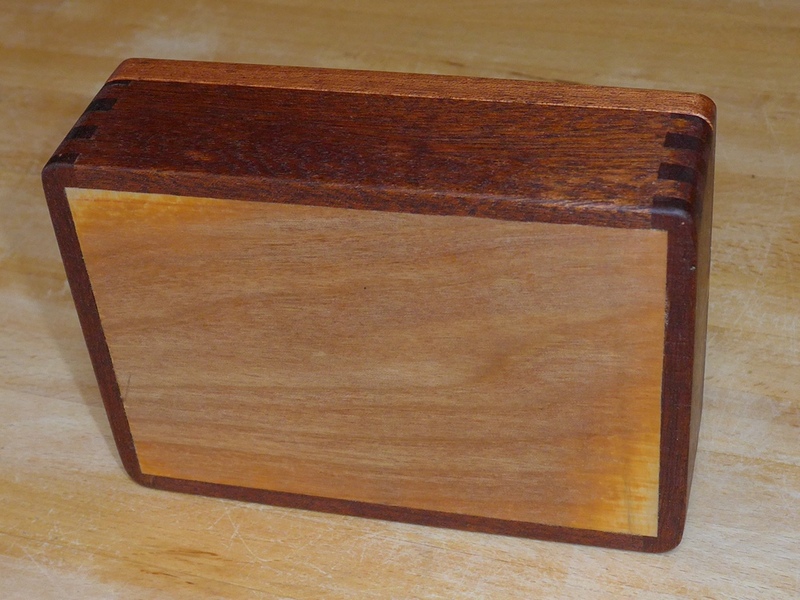 For a finish I used Brandon Bespoke Wax Oil Treatment, applied with paper kitchen towel, as directed, and left overnight. 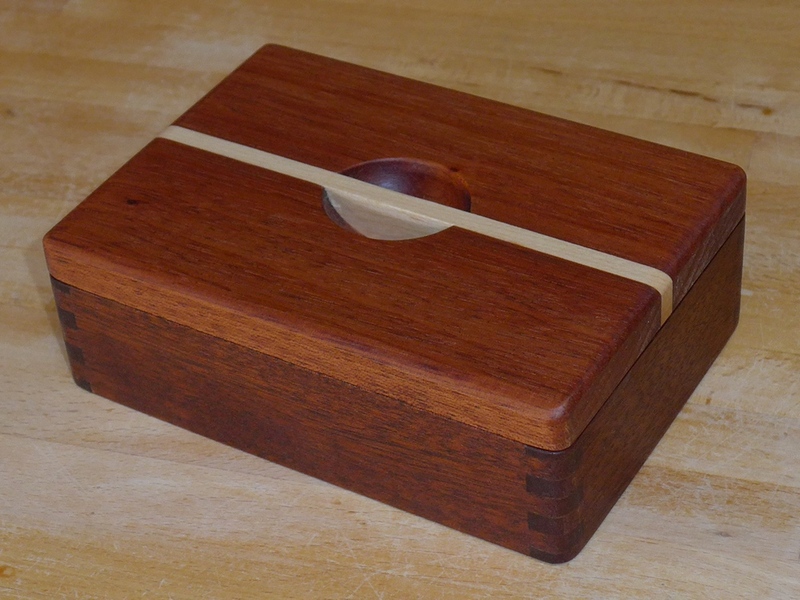 I used a cotton bud to get the wax into the inside corners of the box. 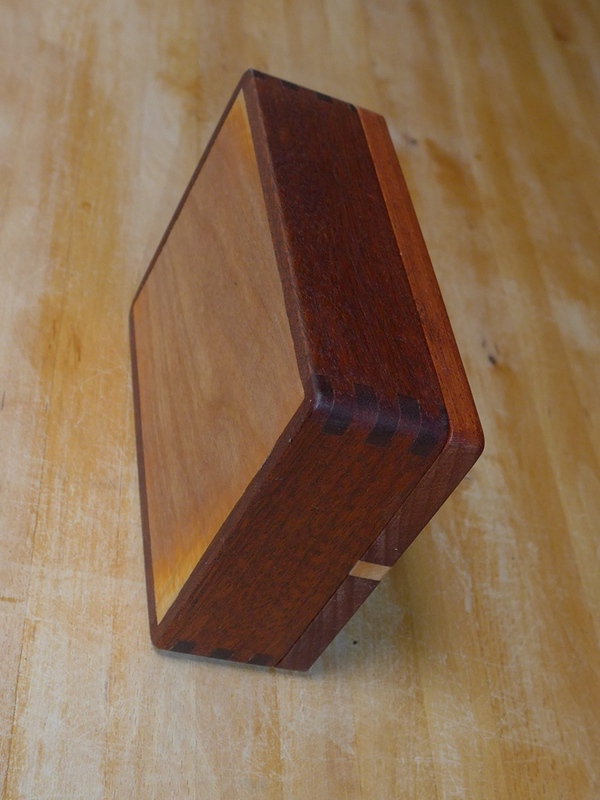 The next day I buffed the wax finish. 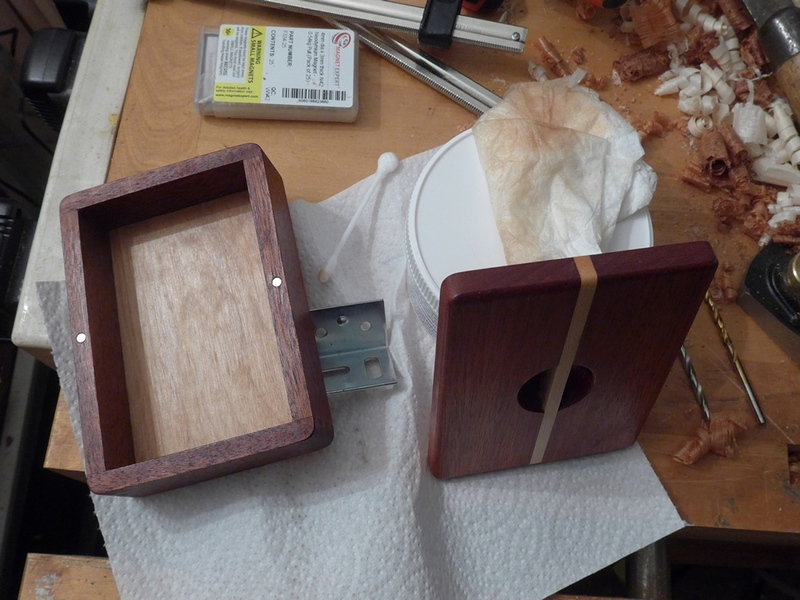 It didn’t have as much sheen as I’d expected, so I added another coat of beeswax to the top only and buffed that. 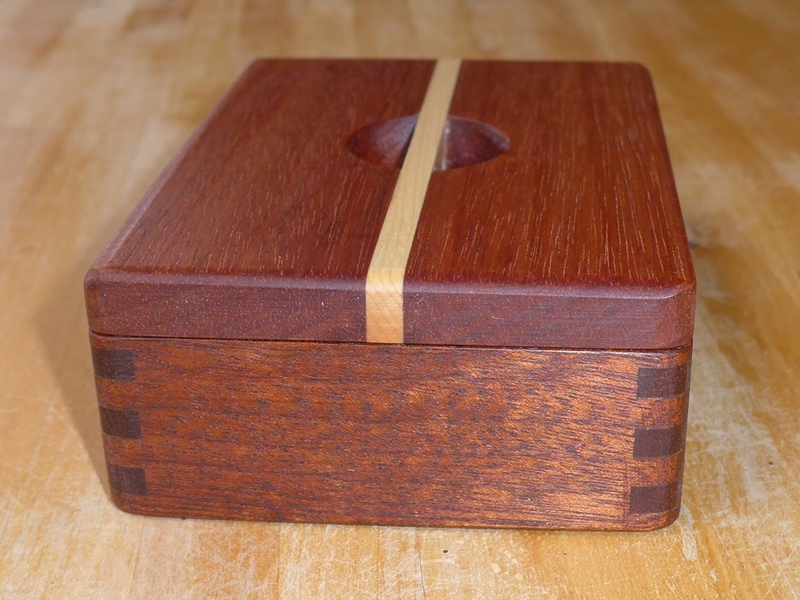 Used the wrong wood for lid! 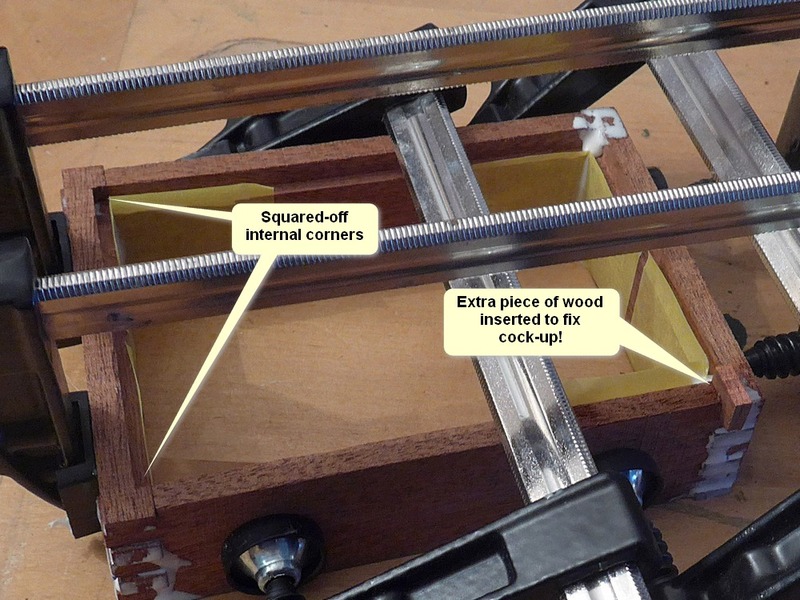 Not really a fault but it dawned on me afterwards that I could have arranged the magnets’ poles such that the lid would only go on one way round. 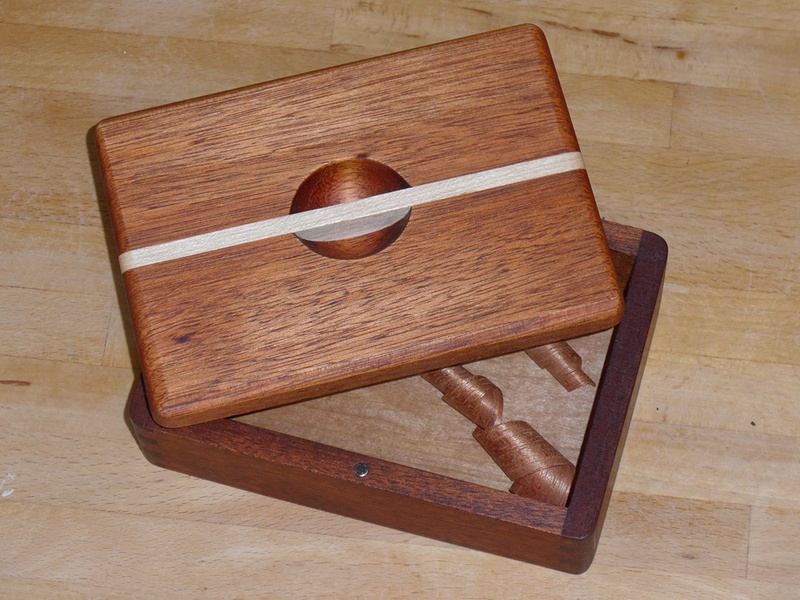 Then the magnets would repel if you tried to put it on the wrong way. 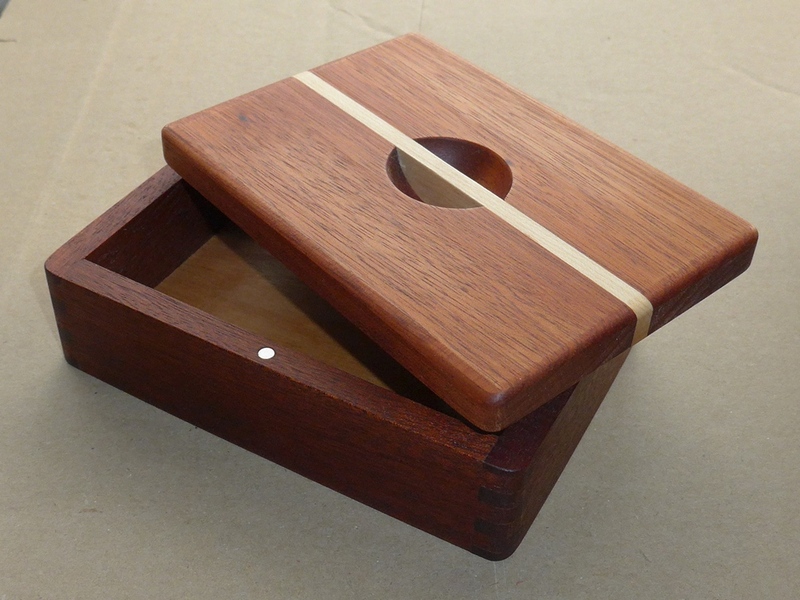 Invariably a lid will fit better one way or another; that trick would have enforced its orientation. 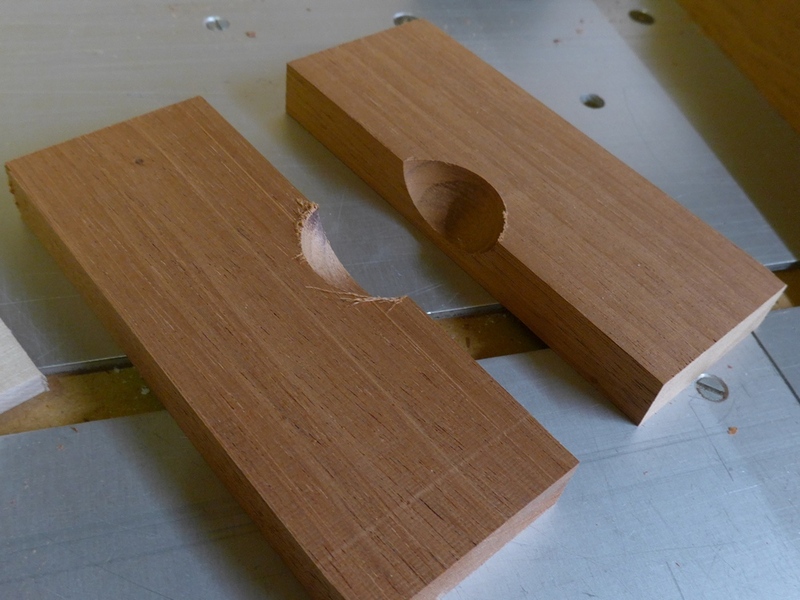 I broke a piece off while cleaning the corners with a chisel. 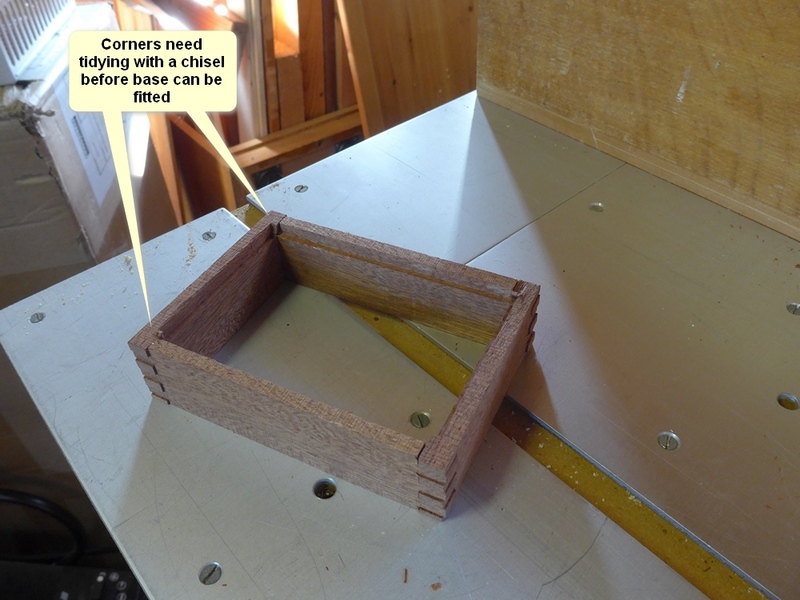 I realised afterwards that I should have left it until after the sides were glued before I tidied up the internal corners – that way the wood would have been supported underneath because all the ‘fingers’ would have been inter-meshed. 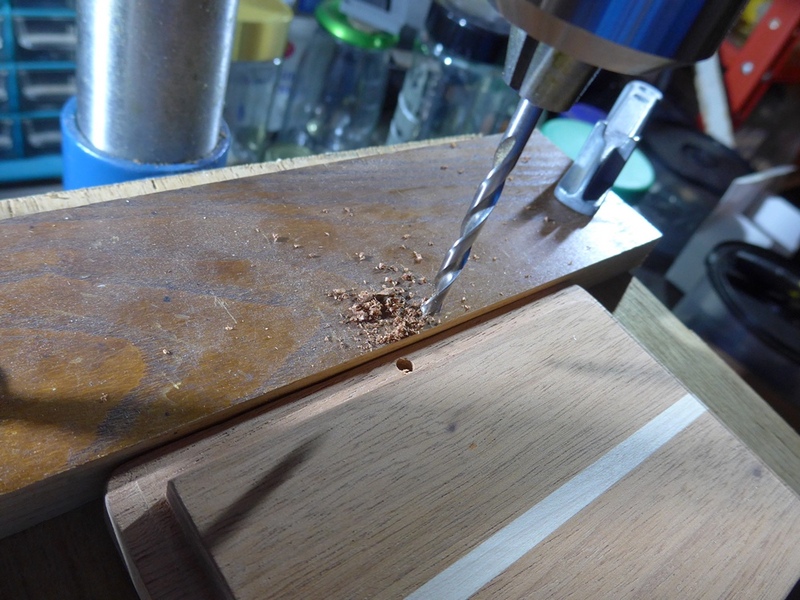 Burnt the wood when routing handle recess (can still see it in photos) – maybe a slower router speed would have helped for such a large bit, but it was already fairly slow. 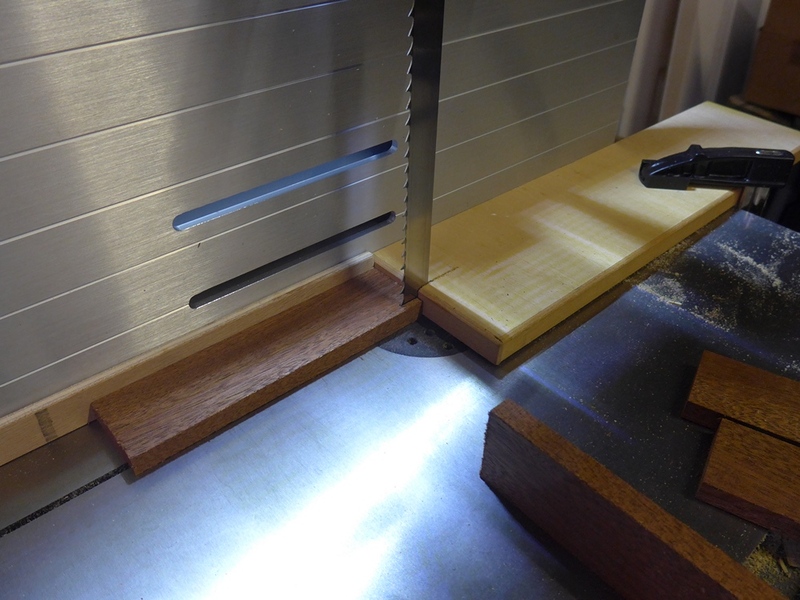 Router snatched when routing rebate for base – should have used much narrower fence opening. 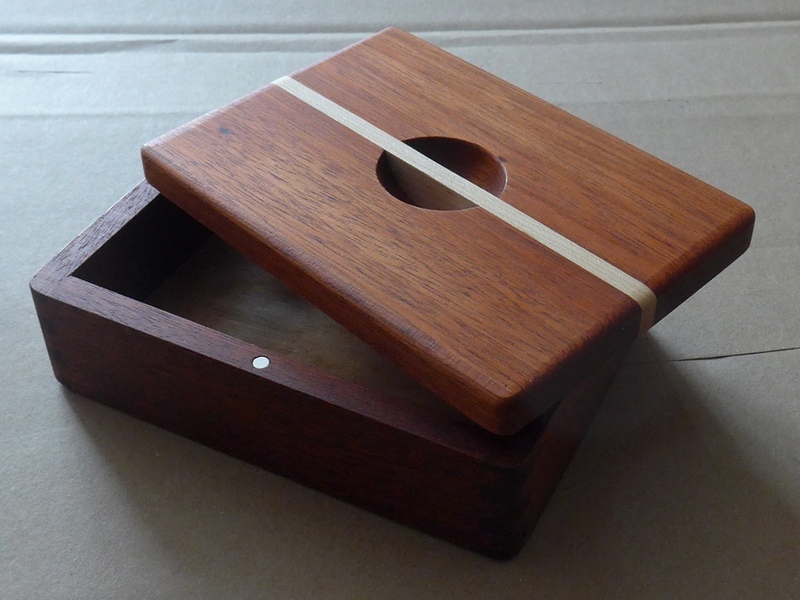 Finish did not give the sheen I was after – have emailed manufacturers for advice. 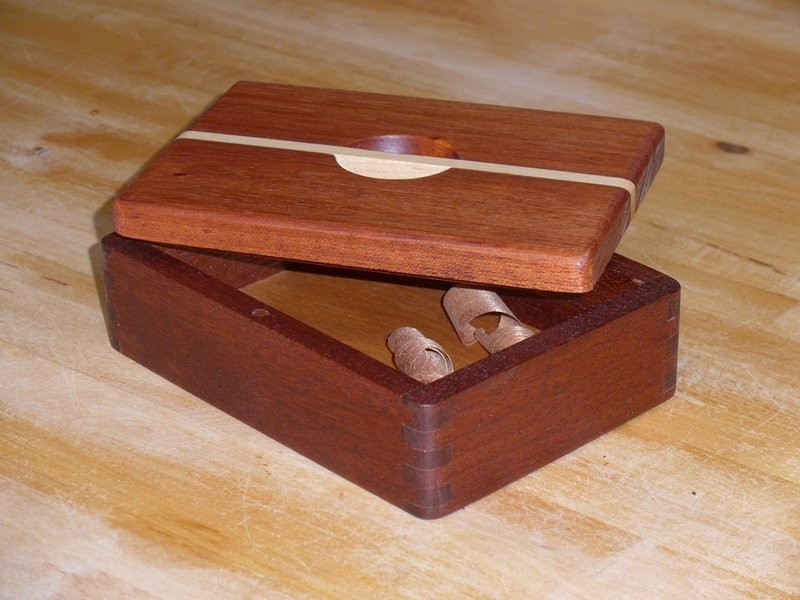 Loved the trinket box,! 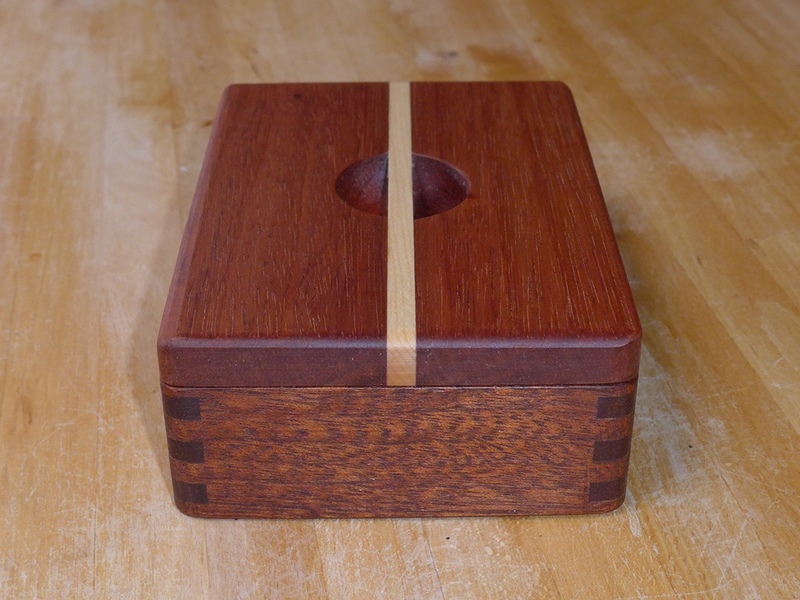 A lovely job, well done. 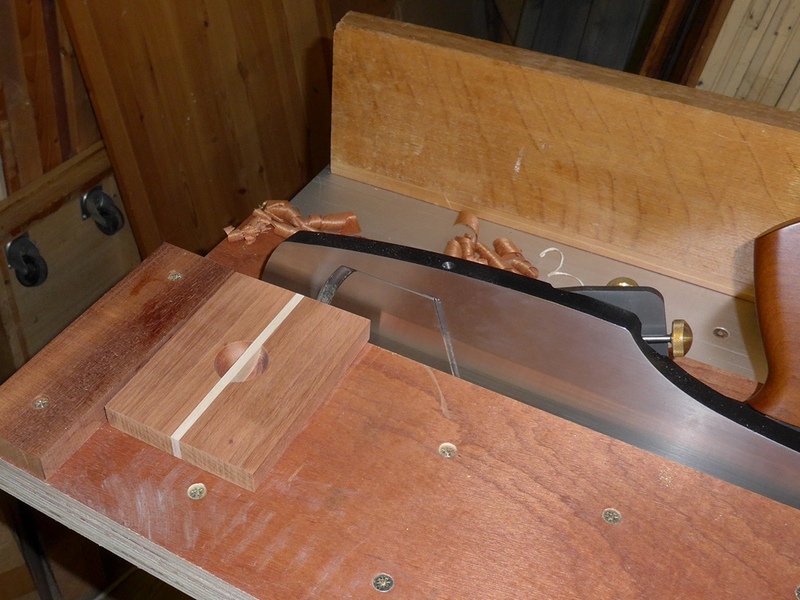 You also made a really good job of the antique knife handle It looks good for another 100 years at least!